You can’t watch tv or listen to the radio the first few weeks in January without being deluged with diet programs of every kind. The tv show Biggest Loser promises to return “Bigger and Bolder” than ever – perhaps not the best choice of adjectives for a show on dieting. Even Jane Fonda has resurfaced in leotard and headband to teach AM/PM yoga. Yep, you can work out with her morning and night! Whether you planned to get into shape or not, you may be shamed into doing so. 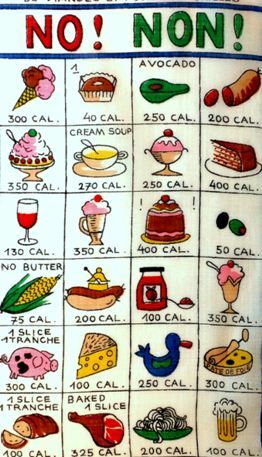 Calorie counting is nothing new, as these 1940’s and 50’s hankies will attest, although methinks they did it with a tad more humor than the curmudgeonly taskmasters of today. 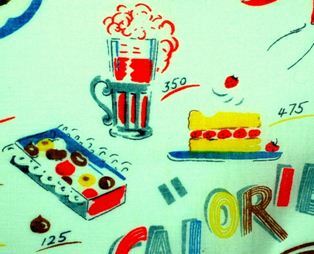 Handkerchiefs were the iphones of their day, containing everything from caloric tables to a profusion of exercise tips. 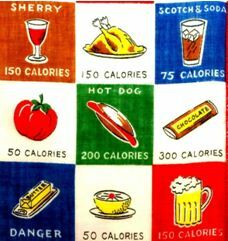 This colorful checkerboard hankie is actually more reminiscent of the enlightened Weight Watchers program, as it includes “forbidden” indulgences, wisely recognizing that no one can live on carrots and celery alone, except perhaps a rabbit. Sherry, scotch & soda, beer and even hotdogs were included! The message seemed to be – have what you crave, just be aware of what you’re consuming. Spaghetti, candy, cheese and cola were all included. 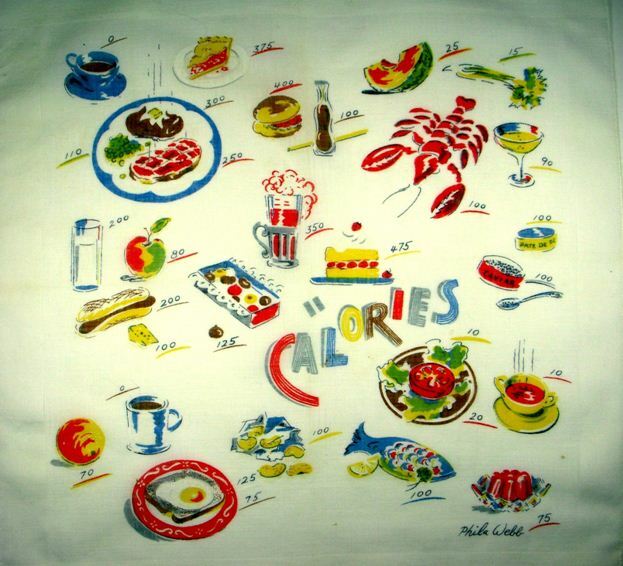 Note, the heyday of the hankie was before diet cola existed. 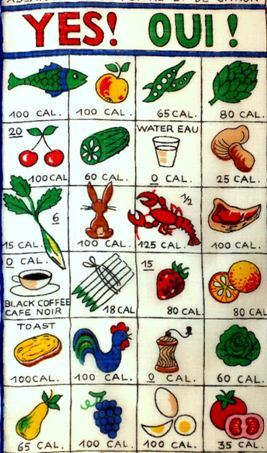 Diet-Rite was introduced in 1958, with Tab following in 1963, so we know this hankie is before that time. 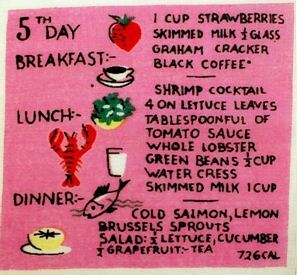 Here are a few snapshots from a large luxurious linen hankie which features not only lobster, but caviar, pate champagne and strawberry shortcake.This is a diet? Sign me up, please. The shortcake floats alongside a nice tall ice cream soda and a box of chocolates. Yikes! The bold colorful graphics on this showpiece swirl and dance in a pattern reminiscent of a 1940’s chintz covered sofa, or those great floral slipcovers of Sister Parrish and Mario Buatta. This fabric would be right at home on the wicker sofa nesting on a veranda in Savannah, or cushioning the front porch swing of a summer cottage in Nantucket. The drawings are deliciously tempting. With your furniture draped in this fabric, you’d have a hard time deciding whether to take a nap or grab a snack. These images are not at all what we’re expecting on a diet hankie. 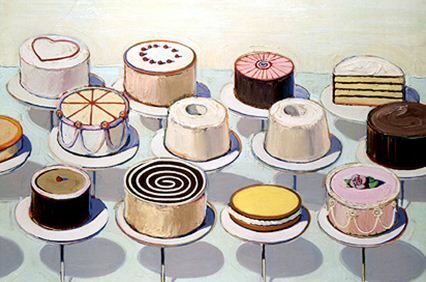 In fact, they bring to mind the joyful pastry paintings of Wayne Thiebaud. 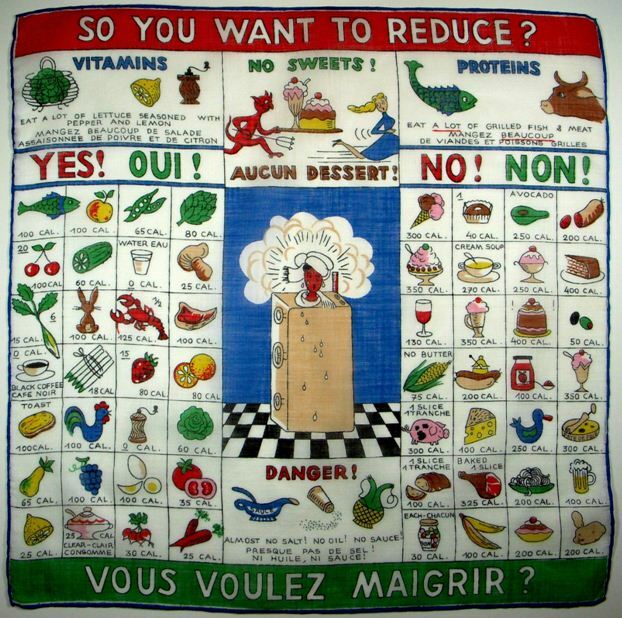 Naturally, if we’re going to envision pastries, we should check out the French version of Madame’s diet. 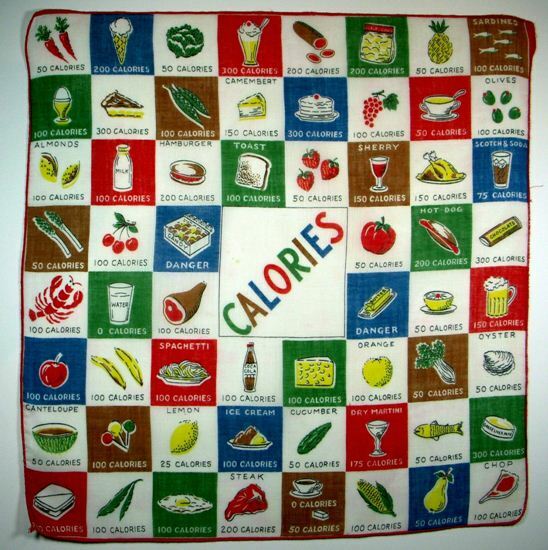 This hankie is packed to the gills with good and evil, healthy and sinful for the serious dieter. The poor gal in the sweat chamber is bombarded with messages of what she can and cannot have. Cool Hand Luke had it easier in “The Box” compared to our Dieting Diva. Whew! As for healthy choices – here’s our ubiquitous lobster again. In addition to the standard fare of consommé, eggs, dry toast, etc. we have lapin (rabbit), artichaut (artichoke), champignon (mushrooms) , jambon (ham), and few other delectables. 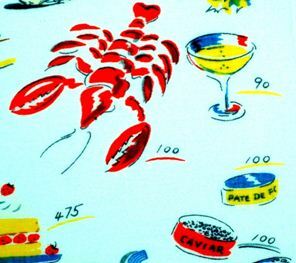 After all, this is France, and if we learned anything from Julia Child, we know that cooking without butter is like a day without sunshine, a relationship without romance, a joke without the punch line….you get the idea. So, If you’re going to carry all the No, No, Nos!, there had better be some fairly scrumptious Yes, Yes, Yeses in the bargain. Mais oui! 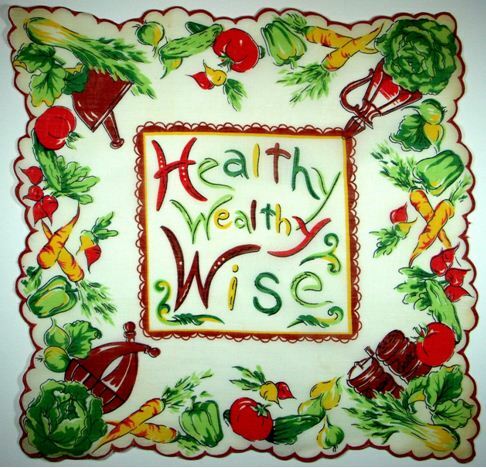 When we think diet, we tend to think “healthy” and “salad.” Here’s a beautiful scalloped edged reminder to tuck in your pocket to keep you on track in a moment of weakness. It’s leafy and lovely, fresh, crisp, and green; a feast for the eyes as well as the tummy, and should help us make a beeline for the salad bar. Not quite as motivating, but fun nonetheless, this bright blue bordered hankie looks more like something a mother would use to teach her child the names of vegetables. Yet look more closely. 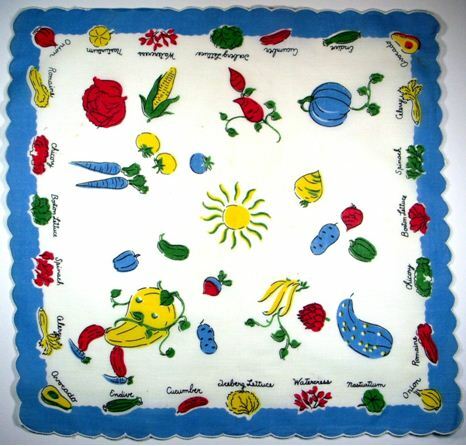 Don’t let the silly vegetable man in the corner lull you into thinking this hankie is for juveniles. Truth be told, you could make a pretty sophisticated salad with nasturtiums, chicory, watercress, Boston lettuce, spinach, avacado, and the like. From turnips to carrots, snap beans to radishes, it’s all here for the taking, and the making of a great salad. 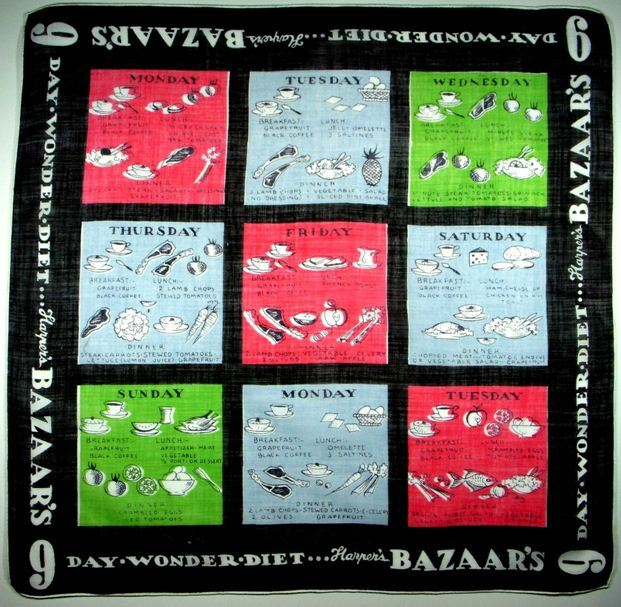 Speaking of sophisticated, this Harper’s Bazaar Nine Day Wonder Diet handkerchief is nothing short of spectacular. 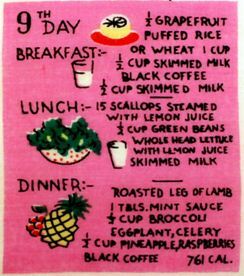 The bold black borders which windowpane lime green, hot pink and sky blue daily menus is fearless, fresh, crisp, and motivating for the dedicated dieter. It’s well worn, so some comely (and surely svelte) lass must have referred to it time and time again. Like our lobster fare mentioned above, this is a diet rich in seafood, and frankly, fit for a princess. Almost every evening dinner consists of steak or lamb chops. I don’t understand the French toast for Friday’s lunch, but what do I know? Once again, sign me up! Lunch consists of shrimp cocktail AND lobster, followed by a salmon dinner. Oooooh kaaaaay. Or how about 15 scallops for lunch followed by roast leg of lamb for dinner? Along with their fashion and lifestyles, the Vogue ladies dined with flair. I can’t help but think of a book I recently read detailing the life of Jacqueline Onasis when she was editor at Viking and later, Doubleday. Lunching with a client one day, she ordered white wine and the scallop appetizer, which consisted of three scallops. She ate TWO scallops and drank her wine. That was lunch. Talk about discipline. Wow. Truth be told, for some reason these hankie menus remind me of Myrna Loy in The Thin Man movies. Myrna was always asking her maid to “Tell ‘cook’ we’ll be having six for dinner.” Or imploring William Powell to “Ask ‘driver’ to bring the car around.” Either she had no inclination to learn their names, or they were replaced so often, it was a pointless exercise. It was off-putting to say the least, even though the films themselves were terrific. The menus on these handkerchiefs aren’t meals you whip up and brown bag to the office. 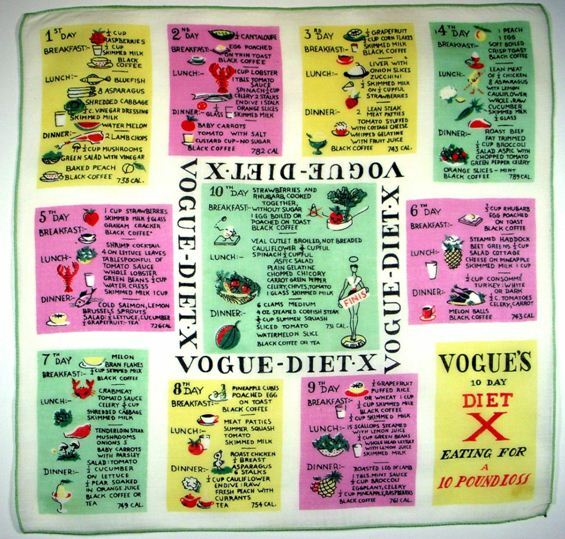 One assumes the ladies of Bazaar and Vogue could easily slip away to a spa to be served these heavenly diets. Indeed, these same magazines, over half a century later, feature the best in spas, diets, and pampering treatments around the globe. Some things never change. So whether you have the luxury to lunch on lobster or you’re nuking a Lean Cuisine at the office, ‘tis the season for renewal and rejuvenation, and my hope for you is that you can do it in the style you most desire. 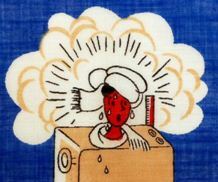 The message of these hankies is treat yourself well. Every day. Indulge, experiment, explore. Keep it fresh, exciting, and fun, and throw in a bit of “Danger” now and then. May this be the start of a grand New Year of possibilities for one and all. Bon appetit mon ami!